Five Tips To Use Your Standing Desk Properly | Dynamic Physiotherapy & Sports Injury Clinic Inc.
Visit a physiotherapy clinic to get fitted for custom orthotics. These are a pair of customized shoe inserts that are designed to cushion your feet while you walk, stand and sit. If you are standing for most of your day, custom orthotics will help evenly distribute your body weight so you’re not putting pressure on only one part of each foot. Some people are able to remember to take breaks, while others need reminders. Whether you have to set a timer or leave yourself a note, you need to take regular breaks throughout the day to rest your eyes, move, stretch and take a little walk. Moreover, taking breaks will ease any discomfort in your back and limbs. You do have to sit at some point. Try alternating between sitting and standing so you’re not standing still all day. You can include sitting time on your breaks (#2). When you stand all day you’re at risk for varicose veins and problems with your tendons and leg muscles. If possible, try to sit down for a bit every 60 minutes. 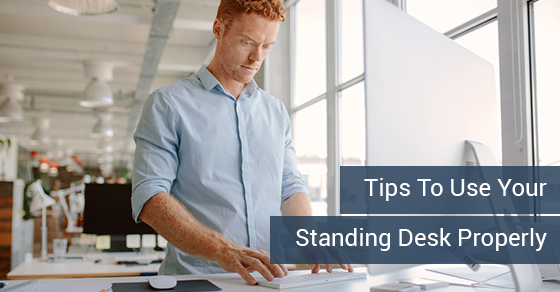 To ensure you aren’t going to be straining while standing at your desk, set your desk at elbow height. For your screen, set it at 51-71 inches from your face and make sure it is at eye level with an upwards tilt of about 10-20 degrees. In addition, you need to protect your wrists by keeping them straight when typing and having your keyboard and mouse resting at the same level. These are specific exercises that are performed to improve your mobility. To get the best exercises available, visit a physiotherapy clinic. Physiotherapists are trained professionals who can create a mobility routine that works for your exact body type and bone structure. You can ask the physiotherapist to give you a routine that doesn’t involve equipment so you can do it on your breaks. You can even learn a routine you can do while standing at your desk and working. You can always contact our physiotherapy clinic for more information about how to properly use a standing desk. Dynamic Physiotherapy can help you stand without discomfort.